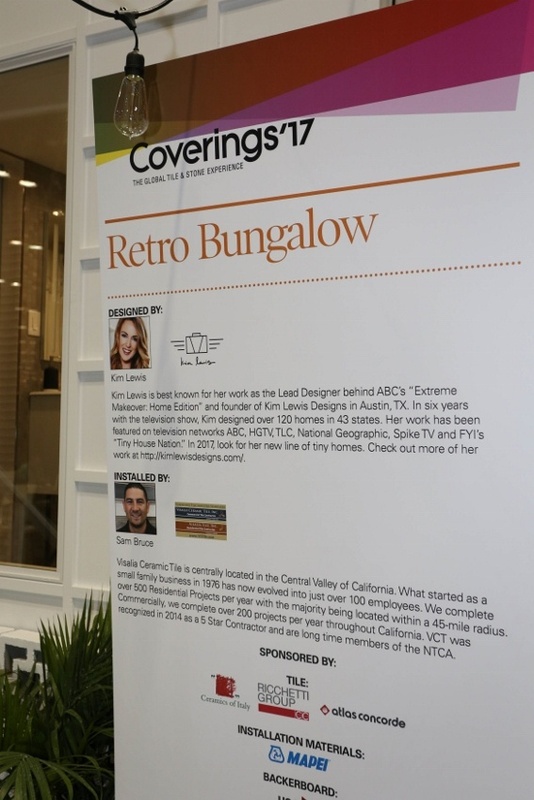 During Coverings 2017, Visalia Ceramic Tile, Inc. joined forces with Kim Lewis Designs during the yearly Installation Design Showcase. 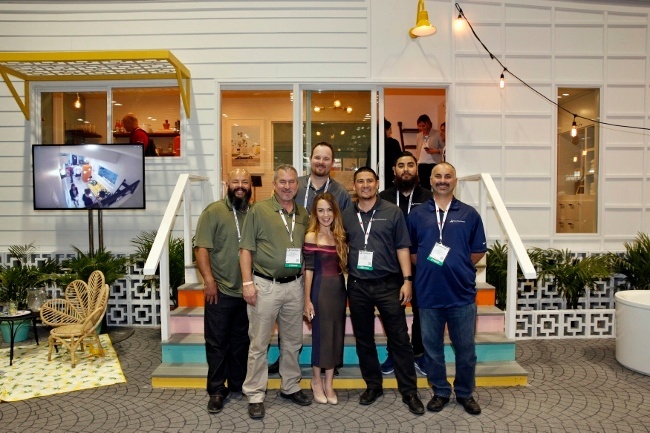 What made this Installation Design Showcase different was that it featured the live installation of tile in three tiny houses on the Coverings show floor. In this case, the team completed the Retro Bungalow Tiny House. 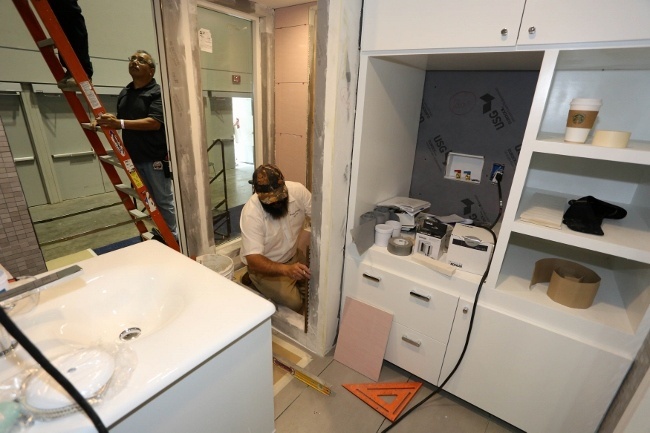 We caught up with Visalia Ceramic Tile's Sam Bruce to ask him about his company and what tiling a tiny home at Coverings was like. CTEF: Sam, tell us about Visalia Ceramic Tile and your role at the company. Have you always been involved with tile? SB: Visalia Ceramic Tile (VCT) is a family owned business that has grown to employ more than 100 people. Currently there are 17 family members who work at VCT. We are located in the middle of California in the town of Visalia. I have been in the tile business since I was 3 days old as I was brought to work with my Mom, Karen Acquafresca, who is one of the current owners. I have held or worked in almost every position of our tile business such as Tile Finisher, Sales Associate, Accounting Manager and my current title President/Director of Operations. SB: I only found out about the Certified Tile Installer Program about 4 years ago. 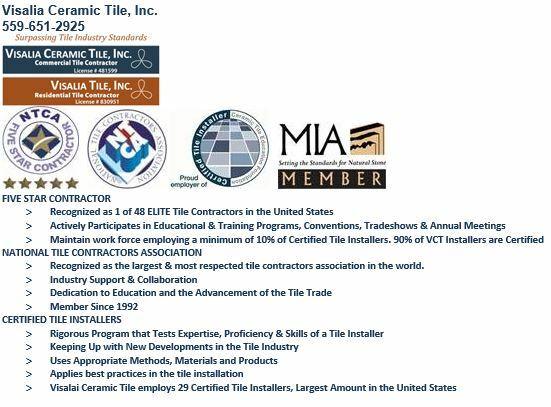 When we learned of the CTI, we thought that it was a great value for our Tile Setters so they could be recognized for their talent and skill. The motivation, dedication and empowerment that was earned after our Tile Setters became a CTIs has been great for our company and for their careers. I include it in my email signature because I believe it is something to share or market. I email clients and customers in the construction industry every day and the logo may catch their attention but it does not explain what it means, how it relates to VCT and why it should matter to them, so we decided to give the logo meaning. CTEF: How many CTIs do you have in your company? SB: We currently have 29 CTIs. 20 of them were certified in one weekend! CTEF: How did you get involved in this Installation Design Showcase (IDS) project? SB: Jim Olson of the NTCA called me in September of 2016 and asked if VCT, as a Five Star Contractor, would be willing to be a part of the IDS. We accepted and were very honored to be asked. CTEF: How did you connect with Kim Lewis? SB: I do not know how we were paired with Kim Lewis. We exchanged emails after being notified that we would be working together and talked with her a little on conferences calls. It was great to get to Coverings and finally meet Kim and her business partner Miranda Burnet. We loved working with both of them as they were quick to answer questions and make decisions, which allowed us to continually do our work. CTEF: What kind of pre-planning was involved and how did it differ from your more traditional projects? SB: Most of the pre-planning was like a normal job, except we were never able to see the progress as the tiny house structure was being built in Texas and we were in California. We had never tiled a tiny home so there was a feeling of not knowing what to expect. Also, we had to ship all of our tools that we would be needing to Florida two weeks before we were to arrive. CTEF: What kinds of installation challenges did the project present? 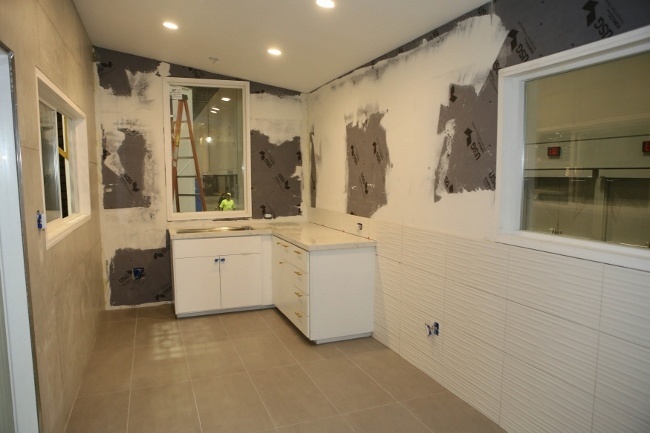 SB: The biggest challenge that we faced was fabricating the kitchen counter top onsite. At our fabrication shop it would not be a big deal, however doing this at the show made it a bigger challenge. Handling a 4’ x 8’ tile added to the difficulty as carrying it wrong at any time could cause it to break, which would mean starting all over again. Everything else went really well as we did lots of prep to make the actual tile installation a smooth process. 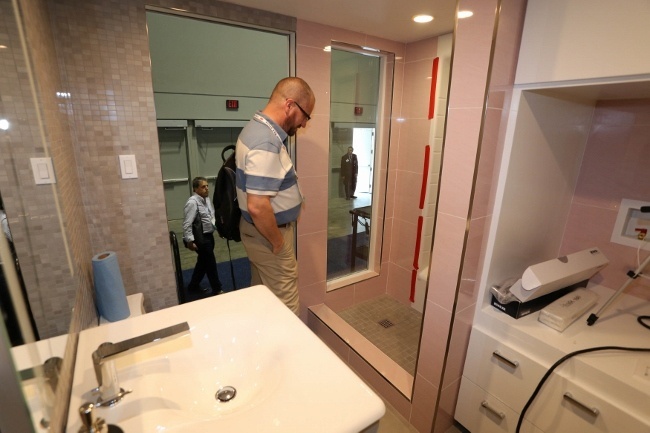 CTEF: What tile products were installed? SB: We installed different tiles from Atlas Concorde, Cerdisa and Cisa. These manufacturers were represented by Ceramics of Italy. The tiles ranged in size from mosaics to 30”x30” tiles. Two of the tiles supplied by Atlas Concorde were from their 3D line which seemed to be made very well as it was very easy to work with. The texture of the tile gave the tiny home a great look as well. CTEF: Who from Visalia Ceramic Tile was involved in the project and how? There were 6 of us who worked on the project from Prep to Finish. Tony Martins CTI#952, Tile Setter with VCT for 24 years. Leo Reynaga #953, Tile Setter with VCT for 22 years. Larry Sims CTI#956, Tile Setter with VCT for 17 years. Luis Valencia CTI#1180, Tile setter with VCT for 12 years. We held a few team meetings between ourselves to plan what we would need and to go over the design of the Tiny Home. CTEF: What were their reactions to the project? SB: They were honored to be a part of it and very appreciative to be in a positon to get an opportunity to showcase their skills. We all loved the Tiny Home and working with Kim and Miranda. CTEF: Were there any last minute changes? SB: I think the only thing that was changed was a grout color which was not a problem thanks to Sam Biondo of Mapei for sending us extra and going to get whatever we needed. CTEF: How critical was it having Certified Tile Installers involved in the project? SB: Having Certified Tile Installers was a must! We knew exactly what we were doing and what we had to do to get the installation done on time and to make it a quality tile job. There are many skilled and talented Installers who are not CTIs who could do a project like this. However, the CTI certification does provide verification that an Installer is qualified for the job. I don’t believe anyone who has taken the CTI and not passed would be able to complete a project like this within the time frame and to the quality that would want to be showcased. CTEF: Any other important points to highlight? SB: For VCT this was a great experience in many ways. 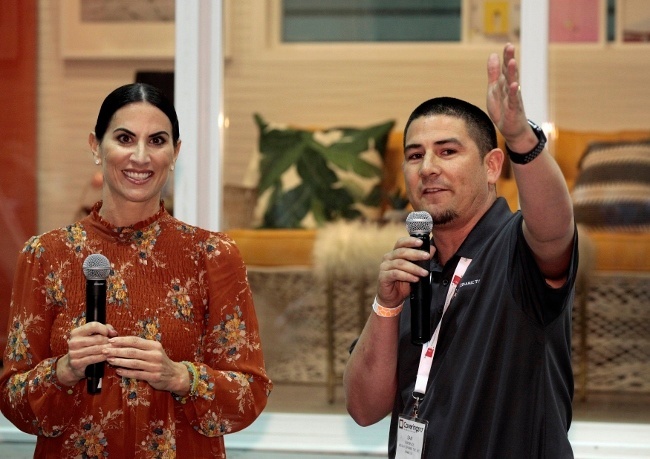 We were a substantial part of the biggest tile show in North America and were able to show what we can do to people in the industry from all over the world. For our Tile Setters this was opportunity for them to do something in this trade that they may have never thought possible, which leads to high motivation, growth and career advancement. It has also gave us the opportunity to meet stars like Kim Lewis and Miranda Burnet who produced and designed the Tiny Home. 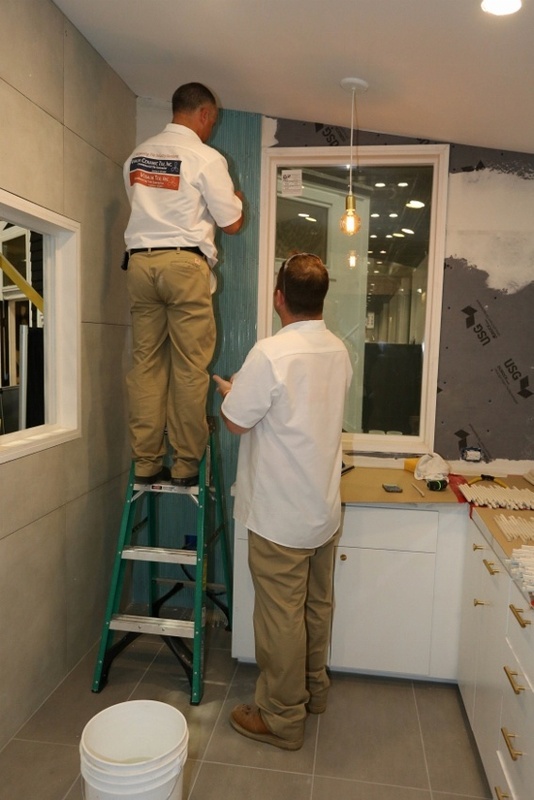 And the best part was getting to work side by side with John Cox of Cox Tile who was the Technical Consultant for the IDS. Many thanks to John who put in a lot of time, work and planning to make the IDS a successful event. 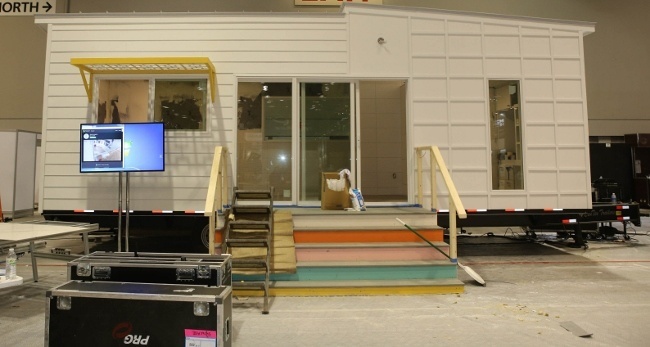 Did you get to see the Retro Bungalow Tiny House at Coverings17? What did you think? Let us know in the comments.